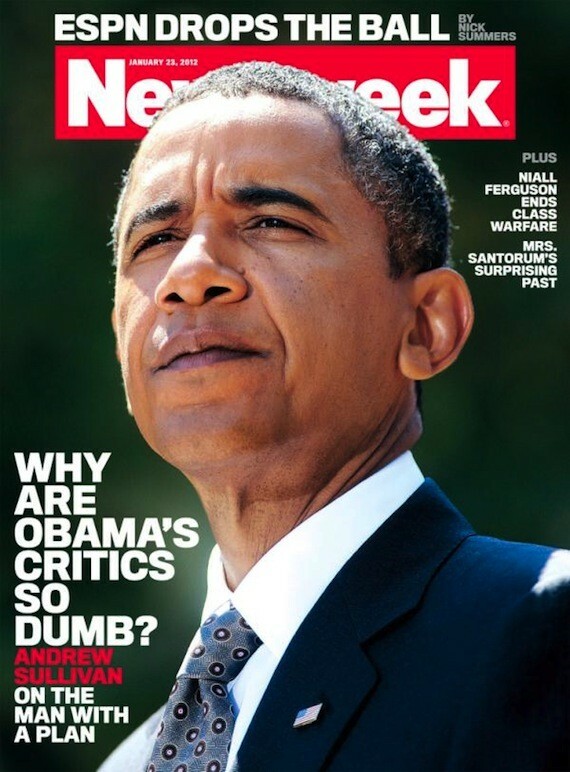 Newsweek has managed to stir up another round of controversy with its latest provocative cover. Last summer, Tina Brown's title riled up the right with its controversial cover photo of Michele Bachmann. The magazine's current issue immediately did the same. It features a story by writer Andrew Sullivan about President Obama. The cover headline? "Why Are Obama's Critics So Dumb?" The article is a bit more nuanced. Sullivan writes that "Obama has delivered in a way that the unhinged right and purist left have yet to understand or absorb." Even so, conservatives pounced. "If in recent years it seems as if Newsweek has been descending into self-parody, it's still hard to imagine that this is real," a writer for the Weekly Standard wrote. The Instapundit blog also mocked the choice of photo for the cover, saying, "He looks terrible, and surprisingly like Jimmy Carter, even down to the downturned liverish lips and incipient jowls." Appearing on MSNBC's "Hardball," Sullivan defended his story, saying he was simply telling the truth about Obama, whom he described as a "sensible, pragmatic centrist." See the cover, and watch Sullivan's defense, below.